Chocolate Covered Marshmallow Santa's. A fluffy marshmallow center covered with a creamy milk chocolate. These Santa's make a perfect stocking stuffer treat. 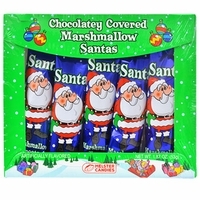 These chocolate covered santa's are individually wrapped and come in a 5 count box. They make a great substitution for bows are your Christmas gifts or hang them on your tree. Kids will appreciate the candy instead of a bow.